University at Buffalo, The State University of New York, took second place followed by California Polytechnic State University, San Luis Obispo, in third place. Stevens’ win comes as no surprise to followers of the competition, as the team took first place in four of five juried contests and maintained the lead position in the competition over the last several days. Stevens Institute of Technology previously competed in Solar Decathlon 2011 and Solar Decathlon 2013. 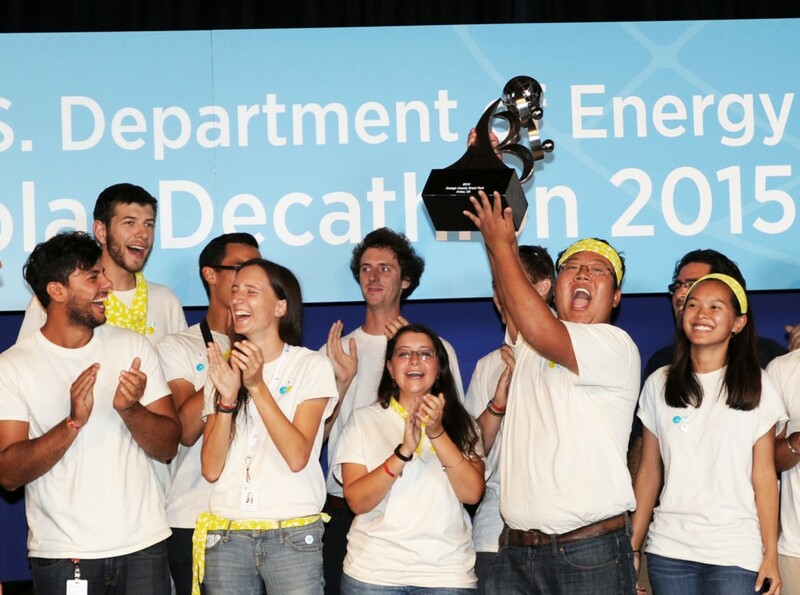 At today’s awards ceremony, Energy Department Assistant Secretary for Energy Efficiency and Renewable Energy Dr. David Danielson congratulated all decathletes on their accomplishments during the 2015 competition. Announcement of the overall winners followed exciting results of the Engineering Contest, in which Stevens took first place with a score of 93 of 100 possible points. Close behind with 92 points for second place was the hometown favorite Team Orange County (University of California, Irvine; Chapman University; Irvine Valley College; and Saddleback College). Texas/Germany (The University of Texas at Austin and Technische Universitaet Muenchen) took third place with 91 points. Full details about these results, scores, and standings are available here. Come check out the winning houses for yourself! Tomorrow is the final day of public exhibit here at the Orange County Great Park in Irvine, California. The Solar Decathlon village is open from 11 a.m. to 7 p.m. today and Sunday. This entry was posted on Saturday, October 17th, 2015 at 5:14 pm and is filed under Awards, Cal Poly, Competition, Contests, Engineering, Solar Decathlon, Solar Decathlon 2015, Stevens, Team Orange County, Texas/Germany, University at Buffalo.